TWO years after the Titanic, and Captain Lord of the Californian was still pleading his case. There follows a freshly resurrected article – important for the historical record – published in 1914 in the Savannah Morning News of Georgia, and carrying the byline of Captain Lord himself. In fact it was an original typescript, drafted by Captain Lord’s friend Frank Strachan, a US shore agent, and submitted with the Master’s approval following an interview with Captain Lord in March 1914. The article, published in the Morning News on March 29, is identical to an article that appeared the previous Wednesday, March 25, 1914, in the Brunswick Evening Banner, also a Georgian newspaper. 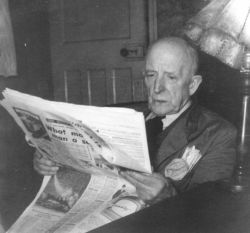 What makes it particularly important, apart from Lord’s continuing indignation at being blamed for the disaster, is that he writes about passing a yellow-funnel vessel (discussed by Californian officers Stone and Stewart after 4am on the morning of the sinking) while responding to late news of the emergency. The 1914 article establishes that the yellow-funnel ship, seen from the Californian at 4am on the eastern side of the icefield, is not the Canadian Pacific liner Mount Temple – which was to the western side. Modern claims have been advanced that the 4am yellow-funnel ship was the Mount Temple. The article makes it clear this could not have been the case – as the yellow-funnel was still discerned to the eastern side while the Californian (having traversed the icefield) was heading down to the Mount Temple (coincidentally a yellow-stacker) on the western side. The way in which the yellow-funnel steamer is mentioned in the following account by Captain Lord, which is entirely en passant, makes it very hard to believe that it could possibly be a construct on Lord's part. And imagine if it were a fabrication... for what purpose? Why in 1914? The reality is that the yellow-funnel steamer never became an issue at either inquiry, or in any public discourse of 1912. Perhaps it should have done! His Own Story of the “Californian’s” Conduct. Of the Steamship Californian, who was in Savannah yesterday. This was so manifestly unjust to myself and the Californian that I at once published evidence in British newspapers showing clearly that the Californian could not have been in the position assigned to her by Lord Mersey. Furthermore, other nautical men, complete strangers to me, voluntarily took up the question, dissected the evidence, and published articles in the Nautical Magazine proving conclusively the Californian was not the vessel that was so close to the Titanic. I also received numbers of letters from experienced shipmasters, many of whom I had never heard of, voluntarily sympathising with the injustice done to the Californian and myself. 10½ knots per hour, as the steamer was making the voyage under owners’ instructions, on reduced coal consumption. On the Sunday in question, the Titanic was behind the Californian, bound to New York, but as she was steaming about 22 knots per hour was naturally making faster speed towards America than the Californian, but the two vessels were on different tracks – the Californian was on the Boston track, whilst the Titanic was on the New York track; the Boston track being some nineteen miles north of the New York track in the particular vicinity where the casualty occurred. At noon on Sunday, April 14, the Californian’s position was definitely established by the customary noon meridian observation of the sun at latitude 42 degrees 5 minutes, longitude 47 degrees 25 minutes. The ship proceeded on the same compass course, via the Boston track, throughout the afternoon and at 4.30pm clearly established she was following that track by giving her position and reporting by wireless to all steamers with range, that she had then passed three large icebergs about four or five miles to the south of her, giving latitude 42 degrees, 5 minutes, longitude 49 degrees, 9 minutes, this as information and warning to all vessels in the vicinity. At 7pm the Californian’s wireless operator was in communication with the wireless operator on the Titanic, and the first thing they did was to exchange and compare clock times, as customary. This is proven by an entry in the wireless log book. At 7.30pm, the chief officer of the Californian took a stellar observation with the sextant, establishing the ship’s latitude as 42 degrees, 5 minutes, which clearly proves the Californian was keeping her same course and track. Still proceeding on the same course at same speed, being anxious and watchful on account of the numerous ice reports that were flying around by wireless from various steamers, I remained steadily on the bridge myself in addition to the watch officers, keeping one lookout in the crow’s nest, and another on the fo'c'sle head, when at 10.21 field ice suddenly loomed ahead. I immediately reversed the engines, but before ship’s way was completely stopped she was bumping in loose field ice on the edge of the ice field. Keeping the engines astern for a minute or two, we worked clear of the thick ice a little, the ship swinging her head slightly, when engines were stopped, and after observing the position carefully and finding ice all round us, I decided it was unwise to attempt to proceed any further that night, notifying engineers of this. After giving all the warnings he could, the sole wireless operator on the Californian retired. While talking to the wireless operator at the door of his room a few minutes before 11 o’clock, I saw another steamer approaching, and asked what vessels he had within reach; he replied: “The Titanic,” whereupon I replied, “That is not the Titanic; she is too small and hasn’t enough lights.” Shortly afterwards this steamer stopped and was bearing S.S.E. about five or six miles from our position. I remained on deck until 12.45am, when I instructed the second officer then on duty on the bridge, to keep the other steamer under observation, thinking she also was stopped in the ice; and having been on duty about eighteen hours, I went into the chart room to rest, instructing the officer on watch to call me should the two steamers drift nearer together. I did not go to bed, simply lay down on a settee with all my clothes, even shoes, collar and tie on, ready for an instant call. At 1.10 the second officer called down the speaking tube that the other steamer was moving away slowly, altering her bearing in a southwesterly direction, and had shown one white signal which had not gone higher than the steamer’s masthead light. I replied asking him if it was a company’s signal or a rocket; he said he didn’t know, so I told him to find out and let me know. Immediately after telling the second officer to find out, I heard him working the key of the Morse signal, and that is the last thing I remember before I fell asleep, having been on duty eighteen hours, and coming from a freezing atmosphere into a steam-heated chart room, I slept very soundly. I was never conscious of any further communications from my second officer or anyone else until about 4.30 next morning, when the chief officer, according to instructions, called me at daybreak. On going on deck I walked round the ship, looking at the ice, proceeding to the bridge with the chief officer to discuss the feasibility of trying to work through the ice. While discussing this and the daylight becoming clearer, the chief officer was sweeping the southern horizon with his glasses, and finally reported he saw a four-mast steamer with a yellow funnel to the southward of us, and asked if we should try to get down to have a look at her. Being much surprised at his question, I asked, “What for?” The mate replied that she must be the steamer that had made signals in the second mate’s watch, might have lost her rudder, or something, and wanted assistance. He then informed me that when he came on watch at 4am the second officer had told him about a steamer to the southward of us that had fired several signals, but subsequently moved slowly out of range, having moved from S.S.E., where she was first observed, to SW½W, proving she moved some eight miles in the course of some two hours. It developed that the second officer had sent an apprentice named Gibson down to tell me that he failed to get any answer to his Morse signals and that he had seen further white signals from the vessel to the south as she was moving away. But if the boy ever opened the door of my room or said anything to me or got any answers it must have been in my sleep, as I am totally unconscious of any such occurrences; and the second officer said had he attached any importance to the signals he would have come down and aroused me himself. It is also a fact that this apprentice, Gibson, called the chief officer at 3.45, talked to him about fifteen minutes about making a new log line in place of [a] log line lost when we backed out of the ice, but said nothing whatever about the signals he had seen while on watch with the second officer from 12 to 4, showing of what little importance Gibson or the second officer considered them. Immediately after the chief officer game me this information I instructed that the wireless operator be aroused and call everyone within reach for news of any vessel that had shown signals, and learned from the German steamer Frankfurt that the Titanic had sunk during the night, but got no information as to the Titanic’s position. 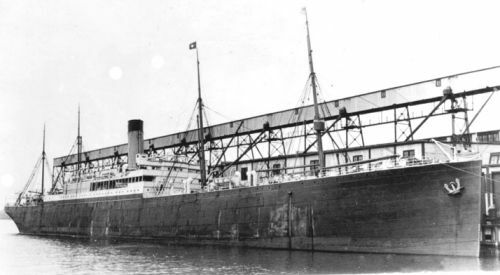 Afterwards we got news from the Allan Line steamer Virginian that the Titanic had been sending S.O.S. signals giving her position as latitude 41.46 north, longitude 50.14 west. At this time we gave the Virginian our latitude, longitude, etc., which supported the previous position described in the earlier part of this article as having been officially recorded from noon onwards during the afternoon and evening of the previous day. I immediately ordered on full steam, picked our way and pushed the Californian through the ice ahead to clear water beyond, then drove the ship under forced draft in a southerly direction down the water’s edge of the ice field some twenty miles. While proceeding in this direction we passed the four-mast steamer with yellow funnel across the ice field to the east of us, considerably nearer the Titanic’s position than we had been all night. Passing this steamer and proceeding south, we next passed the steamer Mount Temple, lying stopped on the water’s edge of the ice field in sight of the Carpathia, also the small Leyland Line steamer Almerian, which had not wireless and had just arrived on the scene. After sighting the Carpathia, we worked the Californian through the southern end of the ice field, reaching the Carpathia at 8.30am, in time to see her taking on board the last boat load of Titanic survivors, when she proceeded to New York, and we cruised around among the wreckage in hopes of picking up further survivors; but finding none, nor even bodies, nothing but wreckage, we proceeded to Boston about 11.30am. Captain Rostron also testified he could see no bodies in the vicinity ere he proceeded to New York. The Winifredian docked at Boston. The Californian would have presented a similar sight. The Titanic did not strike the berg until 11.40, when she sent out her position at latitude 41.46 N., longitude 50.14 west. Long before anyone could have dreamed such a disaster would overtake the Titanic, the Californian’s positions had been clearly established at noon that day, at 6.30pm, and at 7.30pm, by communications and observations recited in the foregoing, which clearly disposes of any attempt on the part of the Californian to have cooked or worked up a wrongful position after the accident had happened. A schoolboy can work out the difference in latitude and longitude as given between the position where the Californian stopped at 10.20, and the Titanic stated she struck the berg in her S.O.S. call at 11.40, as about 19½ miles apart. S.O.S. call was wrong, and the Titanic must have been at least five or six miles south of the position she gave, and this was admitted, in fact argued by White Star Line barristers before the Court of Inquiry, and proven on charts by the course and distance steered by the Titanic as evidenced by her officers. This was also apparent to me on reaching the scene of the wreckage as we had to steam considerably more than nineteen miles to reach there; all of which tends to prove that the Titanic was really about twenty-five miles from the Californian, rather than five to eight miles as considered by Lord Mersey. Now let us take Captain Rostron’s testimony on arrival at the scene of the disaster. He testified that when day broke he sighted two steamers six to eight miles north of him, neither of which was the Californian, [and] that the Californian only came in sight of the Carpathia about 8am. The two vessels sighted by Captain Rostron were undoubtedly the Almerian and Mount Temple. The captain of the Mount Temple also testified that at daybreak he observed another steamer on the western side of the field, having two masts with black funnel and white device. This steamer has never been identified, nor has the four-mast steamer with yellow funnel, passed by us further north ever been identified. It must be remembered the Californian’s engines were never moved after 10.25pm, and it was a calm, flat, wind-less night. The two lookout men, who were in the crow’s nest of the Titanic, testified positively that when the Titanic collided with the berg, no steamer nor lights were in sight. This, coupled with the fact that the Californian’s engines were stopped, proves clearly that the steamer observed by the Titanic as approaching her about an hour later, could not possibly have been the Californian. Furthermore, had the Californian been in sight of the Titanic at the time of the disaster, she would assuredly have been in plain view of the Carpathia after daybreak; whereas Capt. Rostron testified that the Californian did not come in sight until about 8am. It must be remembered that the chief officer did not wake me until daybreak, and the Californian’s engines were not moved until about 6 in the morning after we had learned of the disaster. These facts prove it was a physical impossibility for the Californian to have been the steamer seen by the Titanic. Also it seems self-evident there was at least one, if not two, steamers between the Californian and Titanic at the time of the disaster. It was also suggested at the inquiry that one of the steamers between the Californian and the Titanic saw the Titanic’s signals and answered them, but on account of ice failed to reach Titanic. This suggestion was pooh-poohed by Lord Mersey and dismissed with some such remark as “Who ever heard of one vessel answering another’s distress signals?” Yet Capt. Rostron testified before the same court of inquiry that he sent up white distress rockets to let Titanic’s boats know he had seen their flares. Again, I would point out that I never was placed on trial, but simply called as a witness at the Titanic hearing and permitted to answer questions. Ever since Lord Mersey’s decision has come out I have used every means in my power to secure an official inquiry into the relative positions of Titanic and Californian on the night of the disaster, and my last letter to the British Board of Trade urged such an inquiry, even going as far as to propose such an inquiry be held, not necessarily for the purpose of submitting fresh evidence, but if necessary simply to deal with the evidence already submitted at the Titanic inquiry, but so far I have been unable to secure an inquiry, notwithstanding my several requests to the Board of Trade, urging and courting a full inquiry into the position of my vessel and my own actions on the night of the disaster – simply an unbiased inquiry based on evidence that has already been submitted at the Titanic hearing. I append hereto copies of articles from the London Saturday Review of May 24, 1913, and the Review of Reviews for July, 1913, and would like to point out that the lamented William T. Stead, who was editor, if not founder and owner of the Review of Reviews, lost his life in the Titanic disaster, and it is hardly to be supposed that that paper, above all others, would have accorded me the support it does in the article, unless fully convinced there had been a miscarriage of justice and that I have been wrongly condemned by public opinion. The above article corroborates Californian Chief Officer George Stewart, who stated at the inquiries that the yellow-funnel steamer probably couldn't get through the ice and thus remained on the EASTERN side of the field. 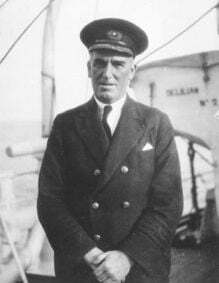 Stewart went on to have an exemplary career with the Leyland line, becoming its commodore Commander, to retire as the former Master of several ships of the fleet. If this yellow-funnel steamer was 8 miles south of Californian, as Captain Lord estimated in evidence, and the Mount Temple another 5 to 6 miles south, with Carpathia about another 4 miles south, then this puts Carpathia about 17 to 18 miles south (not counting the initial east-west traverse) from where the Californian started. This is despite overnight drift from the time when the Titanic sighted her Mystery Ship at close quarters (obviously long before she sank at 2.20am) and the Californian beginning to move long after daylight. Meanwhile the Mount Temple never mentioned the other yellow-funnel vessel. The only detailed description of the four-master seen by Californian to the southward after 4am (when Chief Officer George Stewart relieved Second Officer Stone) comes from Chief Officer Stewart himself. Neither Stone nor Stewart (who had just come on duty) knew where this four-master had come from. Yet despite Stone’s insistence that it was not the vessel he had previously seen during the night, Stewart personally considered that the steamer seen during the night could indeed have gone off to the southwest, but finding the ice impassable there, might have steamed back some distance, unnoticed by Stone. In other words, that it might have been the same vessel Stone and Gibson watched earlier. Wherever she came from, the yellow-funnel four-master was now, at 4am, between the Californian to the north and the Carpathia to the south (unseen), and all three vessels were still to the east of the ice barrier. 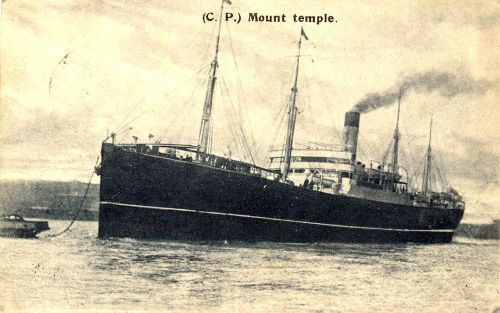 Meanwhile the Mount Temple, a Canadian Pacific vessel, had arrived at the Titanic’s SOS position on the western side of the ice barrier. She was indeed a four-masted yellow-funnel steamer, but her captain testified that he arrived at the SOS position only at 4.30am, having steamed diagonally NE from far to the south and west of the ice barrier. By her evidence, the Mount Temple was certainly out of sight of the Californian at 4am and could not have been the yellow funnel steamer seen by Stewart, which was pointed out by him to Stone. This yellow-funnel vessel was to the south, on the eastern side. Senator Fletcher: Do you suppose that was the same one? The 4am steamer had two masthead lights, not one. It is further away than where the nearby stranger had been stopped, and is not the earlier ship. Neither is it the Carpathia. The Carpathia’s Captain testified that he did not see the Californian, rushing to assist, until 8am. There is a difference in the bearing of the yellow-funnel ship, Stewart seeing her to the southward, and Lord mentioning southwest. He says she was to the "southward" in the 1914 article here. It may or may not be important. Stone, of course, says this ship was “about south” and “just abaft the port beam” when the Californian was heading WNW (halfway between west and northwest). This amounts to the same thing. One can only speculate as to the identity of this yellow-funnel vessel. But she was apparently not the vessel previously seen by the Californian. 8851. What kind of a steamer was she (at 4am to southward)? — A four-masted steamer with one funnel. 8852. Have you been able to ascertain what her name was? — No. 8853. Stewart — Well, we never knew what ship that was, that we saw to the southward. Chief Officer Stewart’s use of “we” implies he and Lord, if not the entire ship’s company. Lord, who had also studied the yellow-funnel steamer by 4.30am, using glasses, later saw the Mount Temple on the other side of the icefield and drew no connection between them. Br. 6998. — I only saw one steamer, passenger steamer, of any size that day, and that was the Mount Temple. 6999. Is the result of your evidence that you cannot suggest the name of any other passenger steamer that was in the neighbourhood of your vessel at about midnight on the 14th April? — No, I cannot. Californian later passed the Mount Temple at about 7.30am in the vicinity of the SOS position (Br. 7014/5). She was stopped. Neither Lord nor Stewart equated her with the earlier yellow funnel vessel. There were more vessels in the immediate locality — and at an early stage — than is commonly imagined. She was visible to the Californian at eight miles away at that time, and the Californian saw no other ships at this time – certainly not the Carpathia. The Californian, therefore, was over the visible horizon from the red-funnel rescuing Carpathia and must have been at a considerable distance from her, even in the bright daylight. With thanks to the US public library service. All text, pictures and photographs copyright of the author.